(Left to right) Barbara Geppert, co-president of the GFWC-LO, Renee Miron-Alimpich, club secretary and Sharon Collins, co-president of the GFWC-LO. Miron-Alimpich was honored as a Woman of Achievement during the state convention in April. 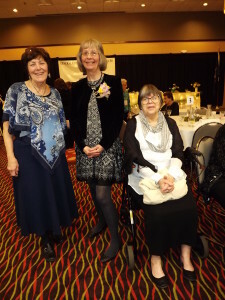 General Federation of Women’s Clubs (GFWC) – Lake Orion member Renee Miron-Alimpich was honored as a Woman of Achievement during the 123rd GFWC State Convention April 20–22 in Big Rapids. Miron-Alimpich, the club secretary, was chosen as GFWC Lake Orion’s Woman of Achievement because of her activity and commitment to the club’s volunteer events. She was among 20 Women of Achievement from across the state who were featured at the banquet. They were honored by GFWC International President-Elect Mary Ellen Brock and GFWC Michigan President Donna Brown. Eight members of the local GFWC attended the event: Co-Presidents Barbara Geppert and Sharon Collins, Treasurer Jeanette Lacey, Secretary Renee Miron-Alimpich, Margaret Uzelac, Linda Toothhacker, Susan Armour and Suzanne Baber. Convention topics covered volunteering, membership, computer processes and funding projects. The final event of the convention was the installation of officers for 2018-20 and they are: President-Elect Sue Johnson of Evart, First Vice President Ruth-Ann Northon also of Evart, Second Vice President Kathy Lewis of Rochester Hills, and Secretary Karen Krumm of Manistique. The installation was followed by a champagne reception in honor of the 2018-20 President-Elect Sue Johnson. – S.C.